The kitchen is where it’s at! It’s also the area of the home that sees the heaviest usage. All that food prep – and all that eating! 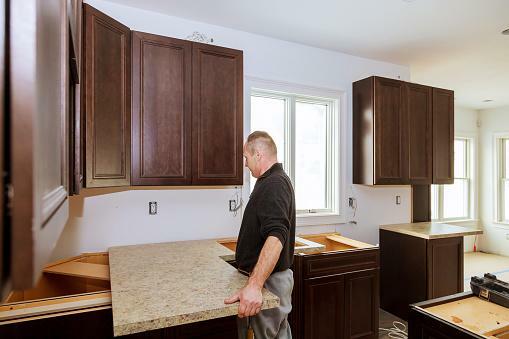 – has your countertops, table, floors and appliances pulling full-time duty for hours each week. It is these reasons, beauty and practicality, that make kitchen renovations incredibly popular among homeowners. Give your kitchen a makeover, and you’ll almost feel like you’ve got a brand-new home. Wondering how to make that happen? We’ve got you covered! Whether you’ve still got an avocado-green fridge, circa 1978, or your kitchen looks like it sprang out of a magazine and just needs a quick touch-up, we’ll show you how to give it a facelift on a budget. Here’s 4 ways to bring your dream kitchen to life. With $5,000, you can give your kitchen a superficial touch-up that can pack a big punch. You’ll be able to spring for a fresh coat of paint, replace the faucets, pick up a new light fixture, reupholster or change the fabric on your chairs and windows and spruce up the area with some modern accessories. With $15,000, you can do all that plus a whole lot more. You’ll be able to buy a new appliance or two, replace your countertops and even install new and budget-friendly cabinets. If you’re planning on spending more, you might be able to re-do your entire kitchen. When determining how much to spend, though, remember that kitchen upgrades can pay for themselves. Experts say that recently remodeled kitchens usually return between 80 and 105 percent of their cost when a home is sold. And until you decide to sell, you’ll be the one enjoying your updated kitchen! Cabinets with wood or plywood panels and solid wood frames are sturdy, budget-friendly, and fashionable. Refinish the outside of your cabinets instead of replacing them for a new look that doesn’t bust your budget. Install wall-mounted shelves to add storage space to your kitchen without splurging on new cabinets. Don’t forget your sink when upgrading your kitchen. Replacing the faucets, bowl or hardware can modernize your kitchen without costing much. When changing your faucets, make sure you know the ins and outs of your options. Want to go with the flow? Brushed nickel is the most popular choice for faucets, largely due to its durability. If you hate scrubbing those fingerprints and water spots, you’ll be happy to hear that nickel conveniently hides dirt and grime. Short on cash? The least expensive faucet finish is chrome. For a long-lasting material that won’t cost a pretty penny, go with brass instead. Farmhouse bowls are super-large and deep and are the perfect choice for people with numerous dishes to wash on a daily basis. On the flip side, their large size means they might require a customized base cabinet for installation. Top-mount bowls have a “drop-in” rim that keeps the sink in place on the countertop. This makes installation simple, but creates a prime place for dirt and grime to accumulate. Undermount sinks are trendy and look sleek, but can take double the time and work to be installed. This is where you chop, dice, measure and mix your ingredients. Your counters need to be durable and easy to clean – and help finish off your kitchen’s upgrade. The trending countertop choices are granite, quartz and stone. These materials are beautiful, easy to maintain and can last for years and years. If these options are not in your budget, consider engineered stone instead. It will give you a similar look for a cheaper price. For something more budget-friendly, you might want to go with ceramic tile. It’s durable, comes in almost any imaginable color and is a fraction of the price of stone. Another great option that is just as cheap is laminate. It’s easy to install and also comes in a large variety of patterns and colors. Lastly, consider going with solid wood. You can have it sanded and treated to give it an extra long life, and it will give your kitchen a warm, hearty finish. Longing for an upgrade and short on savings or cashflow? You can still have your dream kitchen. Call, click, or stop by Lincoln SDA Credit Union today to learn about our Personal Loans or Home Equity Lines of Credit. We’ll help turn your dream into reality!